Office Closure Friday Feb 1 and Hobiyee at PNE! Our office will be closed Friday, February 1st in order to prepare for Nisga’a Hobiyee (New Year) celebrations. We will reopen as normal on Monday, February 4th. In the meantime, we encourage you to phone 211 if you are looking for resources or information. Or you can also leave us a voicemail at 604 660 0707. Looking for plans on that Friday or the Saturday? Hobiyee at PNE this year is Friday and Saturday, Feb. 1-2. More information here. 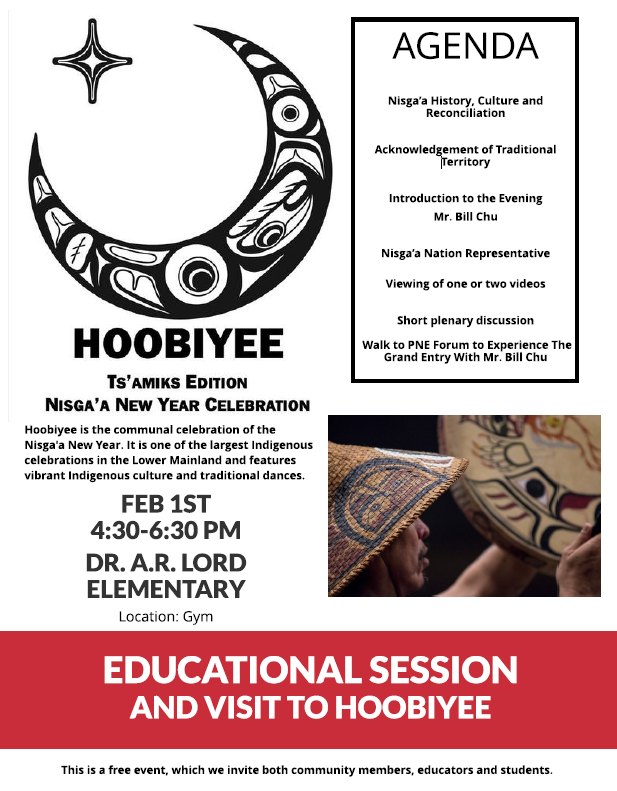 Bill Chu of the Canadians for Reconciliation Society is putting on a Hobiyee educational session Friday Feb. 1, 4:30-6:30pm. Included is a walk to PNE to catch the Grand Entry at around 6pm.